In July, 1937, Mt Vernon Car Company delivered 500 50’ auto boxcars to the C&NW as Lot 9227. Assigned Series numbers 51000-51998, even numbers only. Car 51508, seen here in one of the few photos of these cars, is seen in it’s ‘as-delivered’ lettering scheme in San Francisco in 1938. 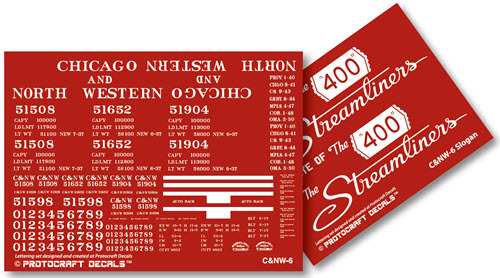 By 1951, the “Streamliners” part of the slogan was no longer to be seen on the C&NW as a result of U.P.’s claim on the use of that word. Lettering and slogans designed and created at Protocraft Decals. Paint & Lettering: During the 1940’s, the C&NW painted their cars a red-brown (Floquil: 1 part #74 and 1 part #186) (Scalecoat: 3 parts #2 and 1 part #13). Lettering white stencil paste. During the 1950’s the cars were painted more of a red-oxide.